This beautiful Ruby in Feldspar is a stunning combination of fuschia hued. Ruby included in Feldspar. 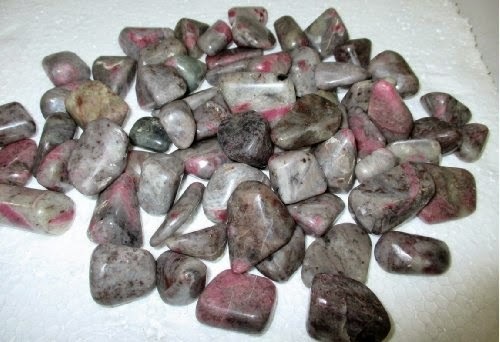 Great for any collection, tumbled Ruby in Feldspar is a perfect piece for the pocket, medicine bag or crystal pouch. Hold while meditating on Divine Love/Source or lay on the body during a healing session. A powerful heart healer, Ruby heals and balances emotions, making the holder more emotionally aware, as well as helping them to connect to others emotionally. The intense and vivid energy of Ruby stimulates loving emotions, helps with the expression of love, and can facilitate states of passion and bliss. Ruby helps us to see the true nature of love, and reveals the Divine Love in everything in the Universe. Using Ruby can help you open up to and receive this Divine Love, as well as become a vehicle through which Divine Love can flow to others. Ruby helps to gather and amplify energy, aiding in opening the doorway to spiritual knowledge. Ruby is a wonderful stone for students as it stimulates deep mental concentration. Physically, Ruby helps with male impotence, and infertility in women; increases circulation, stamina and energy; fibromyalgia and problems with early menopause. Feldspar helps to align all chakras of the body to that of the higher self/Divine Source. It is a wonderful support stone, encouraging strength, insight and courage.